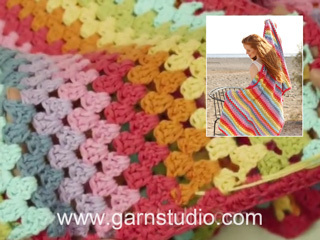 DROPS CROCHET HOOK SIZE 4.5 MM – or the size needed to get 16 double treble crochets/double crochets and 9 rows of pattern-2 on 10 cm in width and 10 cm in height. ROW 1 (= wrong side): 1 double crochet in each double treble crochet. ROW 2 (= right side): 1 double treble crochet in each double crochet. 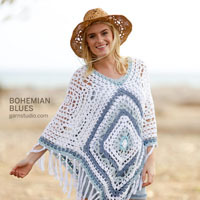 At the beginning of each row of double crochets, replace the first double crochet with 1 chain stitch. 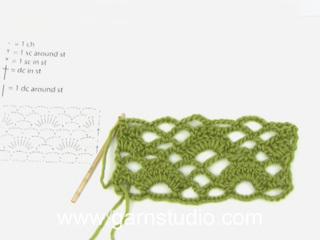 At the beginning of each row of double treble crochets, replace the first double treble crochet with 4 chain stitches. Increase 1 double treble crochet by working 2 double treble crochets in the same double crochet. 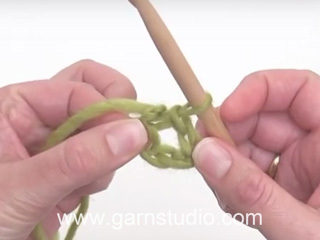 Increase 1 double crochet by working 2 double crochets in the same double treble crochet. Work 4 chain stitches with hook size 4.5 mm and Paris and form them into a ring with 1 slip stitch in the first chain stitch. 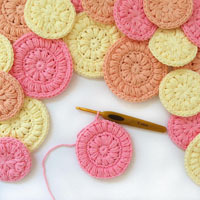 Work 4-4-4-5-5-5 double crochets around the ring – read CROCHET INFORMATION. Turn and work 2 double treble crochets in each double crochet = 8-8-8-10-10-10 double treble crochets. 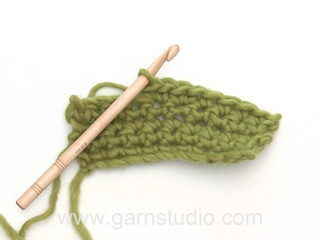 Continue by working PATTERN-2 and at the same time increase 1 stitch crochet in each side – read INCREASE TIP. Increase like this every row a total of 11-13-14-16-18-20 times = 30-34-36-42-46-50 stitches – REMEMBER THE CROCHET TENSION! The piece now measures approx. 12-14-16-18-20-22 cm. 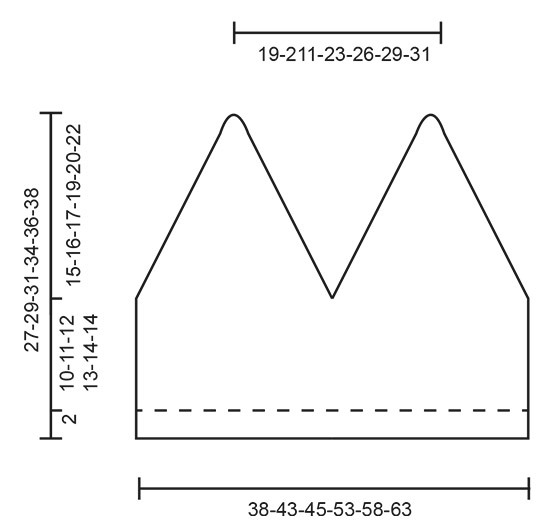 Continue back and forth without further increases until the piece measures 15-16-17-19-20-22 cm – adjust so that you finish after a row of double treble crochets (= from the right side). Cut and fasten the strand. Work 1 more cup in the same way. Now work the 2 cups together. NOTE: Make sure you work both cups from the wrong side! 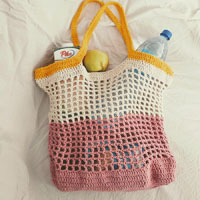 Work 30-34-36-42-46-50 loose chain stitches, then work 1 double crochet in each of the 30-34-36-42-46-50 double treble crochets at the bottom of each cup, work 1 double crochet in each of the 30-34-36-42-46-50 double treble crochets at the bottom of the other cup, then work 30-34-36-42-46-50 loose chain stitches at the end of the row = 120-136-144-168-184-200 stitches. Turn and work 1 double treble crochet in each stitch, finish the row with 6 chain stitches (= loop for button) = 120-136-144-168-184-200 double treble crochets. Continue with pattern-2 as before, but finish each row of double treble crochets with 6 chain stitches (for the loops) until you have worked a total of 4-4-4-5-5-6 loops). When all the loops have been worked, work a row of double crochets AT THE SAME TIME as you increase 0-2-0-0-2-4 double crochets evenly on the row = 120-138-144-168-186-204 double crochets. Cut the strand and start the next row from the wrong side. Then work an edge on each back piece (on top of back), work as follows on back piece with loops: Fasten the strand with 1 slip stitch in the first chain stitch, work 6 chain stitches (= loop), work 1 double crochet in the same chain stitch, continue with 1 double crochet in each of the remaining 29-33-35-41-45-49 chain stitches cast on. Cut and fasten strand. Work 1 double crochet in each of the 30-34-36-42-46-50 chain stitches on the other back piece. Cut and fasten the strand.